As the Sun moves into Gemini today it is a good time to look at the duplicity in your own nature or that of someone around you. We all have different layers to our persona and do not show these characteristics to everyone we meet. In fact, only a few of us can say we are able to share 100% of ourselves with others and even then… there remains a question mark on whether this is the absolute truth. Perhaps there is a percentage of our real selves that we hide even to ourselves. 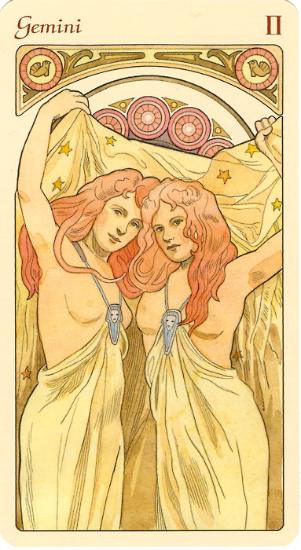 Enter the Sun into Gemini… a card traditionally associated with that of the Lovers in most tarot decks. A card of love but is it love of another or love of the reflection we see of ourselves when we look in the mirror or into our own hearts as we try to fathom out what is truly real for us? On the surface the image on this card looks to be of 2 identical women but look closely and you will see tiny differences including weight, facial asymmetry, position of hands and stars and my favourite… hair under the armpit… lol. What may be obvious to you as you look in the mirror at your identical image may not be obvious to other people. Others may perceive you differently to how you perceive yourself and those little flaws which matter to you are not such a big deal to them. In other words… it’s time to accept yourself as you are… flaws and all. What is your “ideal” may not be the “ideal” of others. Go to the image of the woman you are drawn to… focus your eyes on the pendant sitting in front of their heart and solar plexus chakras. You will see an image in that pendant. As you allow yourself to get “lost” in that image take note of what comes up for you. There is no right or wrong answer… there is only your own self looking back at you and allowing you to accept you as you are in this moment. This card is part of the Astrological Oracle collection by Antonella Castelli and Lunaea Weatherstone. Used by generous permission. Antonella is the artist behind the beautiful Sorcerers Tarot, Tarot of Art Nouveau, Spirit of Flowers Tarot and Angel Voices Astrological Oracle, among others. Lunaea is behind the Mystical Cats Tarot, Victorian Fairy Tarot and Wicca Oracle, among others. This is a Lo Scarabeo deck, published by Llewellyn. 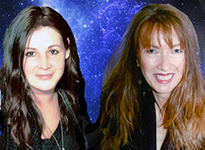 We are both available for live chat, phone or Skype sessions through this site. To learn more about us or to schedule a live session with either of us, click on our individual links below. If we're showing available for chat you can purchase a session and proceed to our respective chat rooms from there. Please note that we do not offer free readings. This month you are likely to be called upon to integrate opposing areas of your life into one big calm, peaceful and harmonious medium. Copyright © 2019 Ask the Astrologers. All rights reserved.